WOW! That is really frilly and looks pretty good. I don't know which I like more: her shades or skirt. Shoulder pads - so 1940's Joan Crawford. 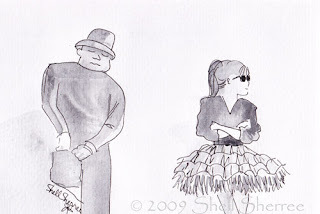 I like the whole together—the shades and the tutu and the "we'll just see who's the cool one here" stance! It would be great if LL Cool J could see these drawings. Alexa: I was thinking the same thing. I think he would really like them. Then again, maybe Shell should do a drawing of Oprah and Steadman and send it to her and fame and riches will follow . . . as will we! Shell, will you please send your sketch to a local designer here so I can have that outfit made? Thanks. from cali, alexa ~ haha, wouldn't that be fun! Grand to know I have a ready-made entourage. The limo will have Ladurée macarons and Veuve Clicquot on tap. PCN ~ by all means, you are most welcome to take it to your local designer. Can she make me one while she's at it? I liked this shot in the video. Maybe because this girl wasn't paying attention to him. Or just because she was his equal. They had Veuve Clicquot at Costco the other day. Kinda ruins the cachet. Oh, good to know, Petrea! The canny Scots in me is naught averse to saving on the limo overheads. Well, I thought that the pose in the video was begging for one of your sketches and wow, just look at the result! You're a true creative genius little Shell and I just love it. Brilliant! Thank you. I just got the "Too-Tu" - I'm a bit slow on Mondays :) You're just too witty! Thank you, too-tu, MmeB! It was indeed a pleasure. Have a lovely evening! We have rain on the tin roof again to serenade us to sleep.